Scientists from USA and Sweden reached for a new discovery proving that the AEG is probely the building block of the primary genetic material even prior to the DNA. The team reached that AEG in cyanobacteria which are one of the most primitive organisms on earth. The answer may be AEG, a small molecule that when linked into chains forms a hypothetical backbone for peptide nucleic acids, which have been hypothesized as the first genetic molecules. Synthetic AEG has been studied by the pharmaceutical industry as a possible gene silencer to stop or slow certain genetic diseases. The only problem with the theory is that up to now, AEG has been unknown in nature. A team of scientists from the United States and Sweden announced that they have discovered AEG within cyanobacteria which are believed to be some of the most primitive organisms on Earth. 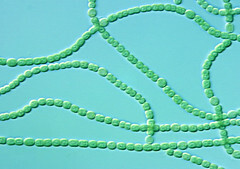 Cyanobacteria sometimes appear as mats or scums on the surface of reservoirs and lakes during hot summer months. Their tolerance for extreme habitats is remarkable, ranging from the hot springs of Yellowstone to the tundra of the Arctic. To determine how widespread AEG production is among cyanobacteria, the scientists analyzed pristine cyanobacterial cultures from the Pasteur Culture Collection of Paris, France. They also collected samples of cyanobacteria from Guam, Japan, Qatar, as well as in the Gobi desert of Mongolia, the latter sample being collected by famed Wyoming naturalist Derek Craighead. All were found to produce AEG. Professor Leopold Ilag and his student Liying Jiang at Stockholm University’s Department of Analytical Chemistry analyzed the same samples and came up with identical results: cyanobacteria produce AEG. While the analysis is certain, its significance for studies of the earliest forms of life on Earth remains unclear.